Barometric pressure often causes levels of fluids in the body to fluctuate. According to The Weather Channel, many humans suffer from everything from headaches to joint pain when barometric pressure rises. 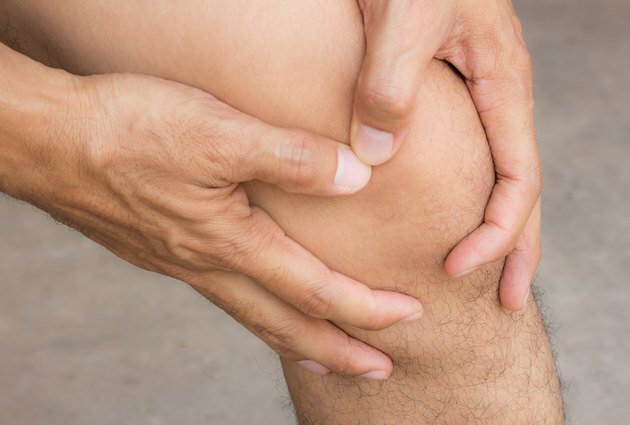 Joint pain is caused by a triggering of neuroreceptors in nerve endings that are sensitive to such change, according to Dr. John Parenti of the Orthopedics Department of the Geisinger Medical Center in Pennsylvania. While the exact cause remains elusive, the fact that millions of people with arthritis or bone and joint injuries complain of pain when the weather turns cloudy or damp remains prevalent in medical practice scenarios around the world. Studies have determined a direct link between humidity and dehydration in the body. High humidity levels in the air thicken the blood, which increases pressure in the blood vessels and requires more effort by the heart to pump blood throughout the body. According to "Nutrition Info: Dangers of Chronic Dehydration," written by Albert Grazia, M.S., N.D., dehydration causes joint pain because joint cartilage contains large amounts of water. Hot and humid environments cause excess sweating and loss of body fluid. Temperature variations have long been believed to be a trigger for joint pain in many individuals with arthritis or other bone and joint injuries. The Rothman Institute of Thomas Jefferson University Hospital stated that changes in weather, such as warm and dry to damp and cold also triggered baroreceptors in joints that caused increased sensation of joint pain in individuals of all ages. Humid weather especially causes already sensitive or inflamed tissues to expand, increasing pain for arthritis sufferers. Why Does Excessive Salt Consumption Cause Edema?